I've been absent on here for a bit. Busy working on several different projects. 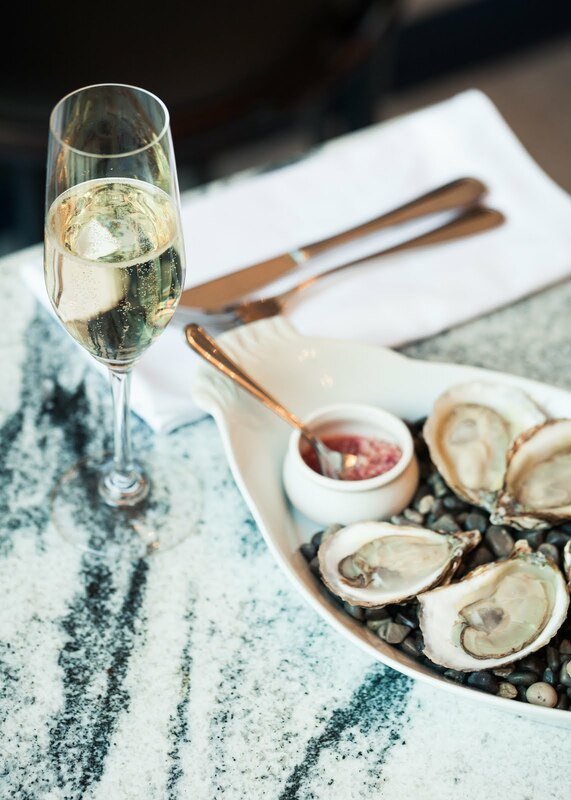 One of the most exciting ones is a new restaurant! Meet Chabrol right in the heart of Yorkville, Toronto. I have been lucky enough to style and brand this little gem. While working with some elements that were left behind from a previous cafe, we worked to create a cozy little space with some Southern French charm. 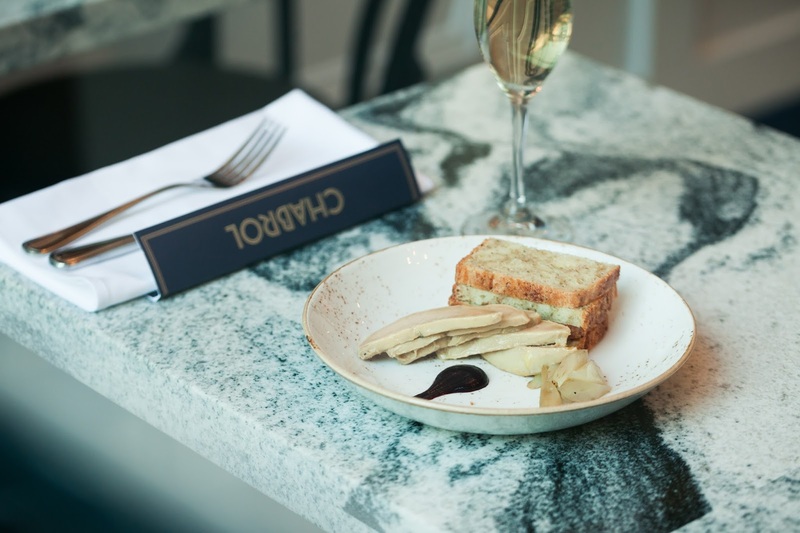 At only 20 seats, it's a petite boite packed with flavour! We wanted to create a space and atmosphere that was classic with a hint of art deco. 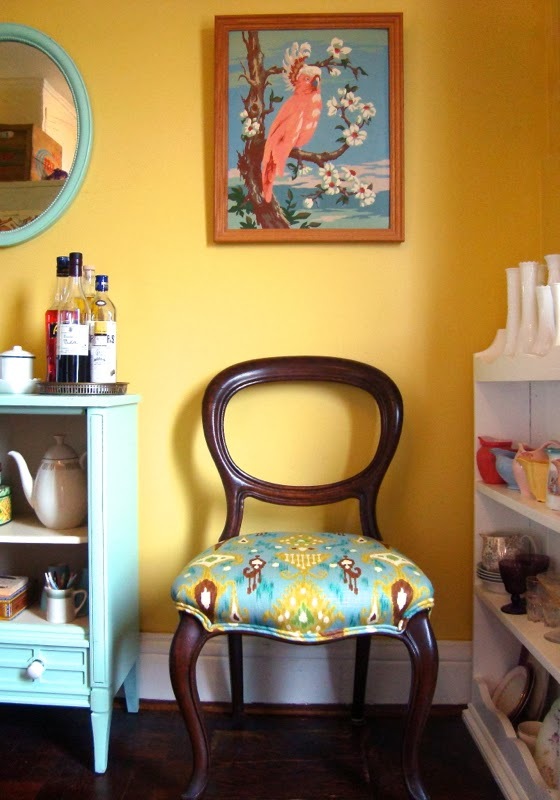 The Bally Blonde is one of my favourite vintage prints and I think she is just perfect looking over the room. 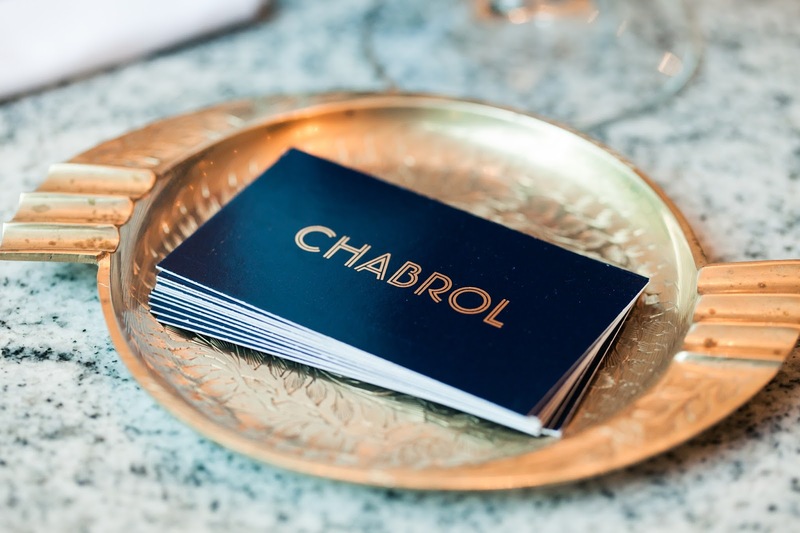 Below is my branding... oh and a brass business card tray I couldn't resist. Stop by and say Hello if you are in the neighbourhood! Its been a very busy holiday season for us this year. 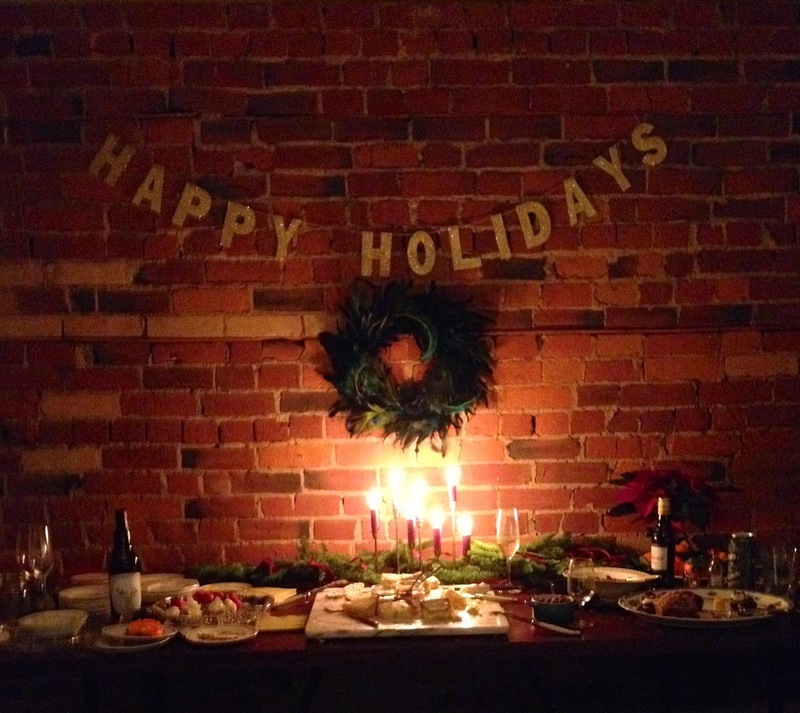 We hosted our annual holiday "Oyster and Stew" bash and then my entire family for Christmas. It was nice to have a full house brimming with cheer and treats. The leftovers are still flowing. We also now know we are able to fit 12 (very creatively) around our dining room table. We have almost been in this Parkdale house for a year and I still feel so lucky to call it home. It is such a bright, warm and inspiring space that I am still discovering. 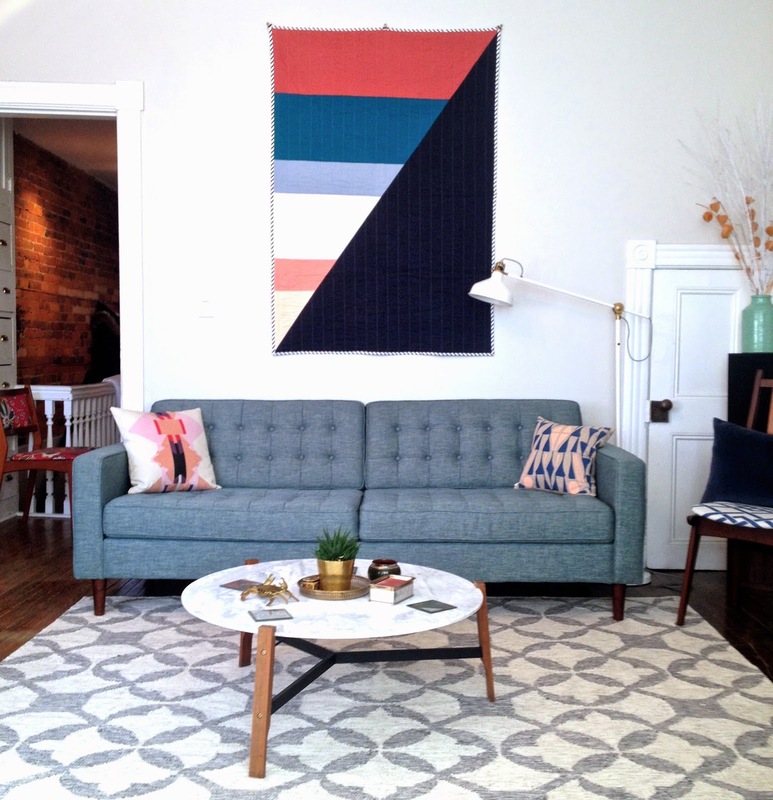 Below is a glimpse of a couple of new additions to the living room, including this amazing quilt form Hopewell Workshop. I finally put down an area rug to camouflage the floors that are just a little worse for wear. I also somehow managed to justify giving myself a marble coffee table for my birthday. The hobbit closet to the right of the couch is about to get stuffed to the brim with christmas decorations…until next year! In the new year I will tackle our master bedroom (there are wallpaper plans in the works) and do a little more work on the bathroom, perhaps a little more paint. More photos to come soon! This summer has been a whirlwind. I have been lucky to have a lot of freedom to enjoy it. Our apartment is coming along, we've been able to get out of the city to visit family in St. Mary's Ontario lots and I was able to spend some time out east with my parents - we threw a big party to celebrate their 40th Wedding Anniversary. I've tossed myself back into the ring for acting things and the other day between a couple of callbacks I decided to stroll over to the local thrift store to see what might be lurking in the shadows. 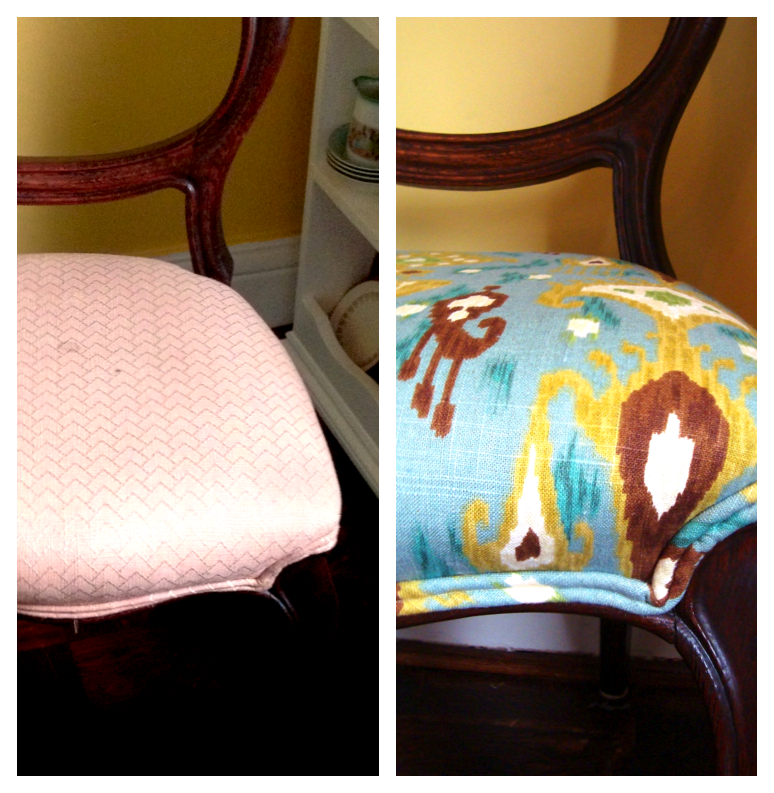 It turned out to be a bumper crop of a day when I stumbled upon this virtually brand new armchair and ottoman. I couldn't believe it was $100 for the entire set! I swear I nearly fell over. All the shop folk could tell me was that it had come in that morning from head office. 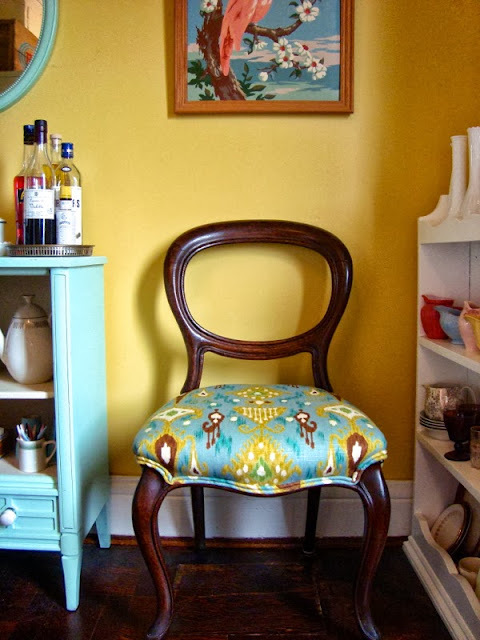 After I brought it home I did a little research online and finally found out that it is a Huggy Mid Century Chair and Ottoman. Listed for up to two thousand dollars more than I paid depending on which site you go to, this was a huge feather in my thrifting cap. Alas…It has been so long since I have posted. In the midst of a crazy move I somehow managed to get pneumonia so I was down for the count for quite a bit. I've got things back up and running now and hope to be a little more present on here. We are really enjoying our new apartment. Slowly but surely it is all coming together. Last week my folks were visiting from Nova Scotia and we went out for an afternoon jaunt on Queen West. Poking around INabstracto, we stumbled upon the perfect little credenza for our new living room. Talking with Kate the owner we learned that these smaller 50's and 60's versions are becoming more and more difficult to find. This one fits perfectly in our space and will work well for our TV. I love that it carries the grain of the wood all the way across the front and the walnut handles are really gorgeous. Also, having not had a television in about 10 years, I'm pretty excited for the thing that sits on top as well. 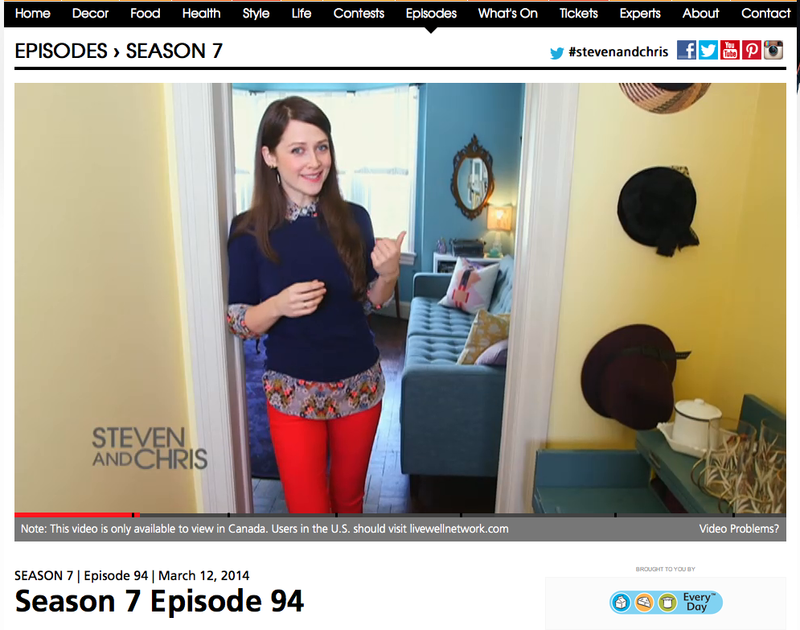 Speaking of TV, I should also report that my old space and I were featured on the show Steven and Chris. Many thanks to Meg and Mary the delightful producer and camera-woman who came over to spend the day shooting. I am the second segment in Episode 94 (Season 7). You can see it all here. If you don't want to watch the entire episode you can simply drag the mouse forward one segment to the second and then I'll give you a guided tour of the space! I have whittled the line down to four different patterns or "personalities". I'd venture to say each tells a different story - some a little more gregariously than others. 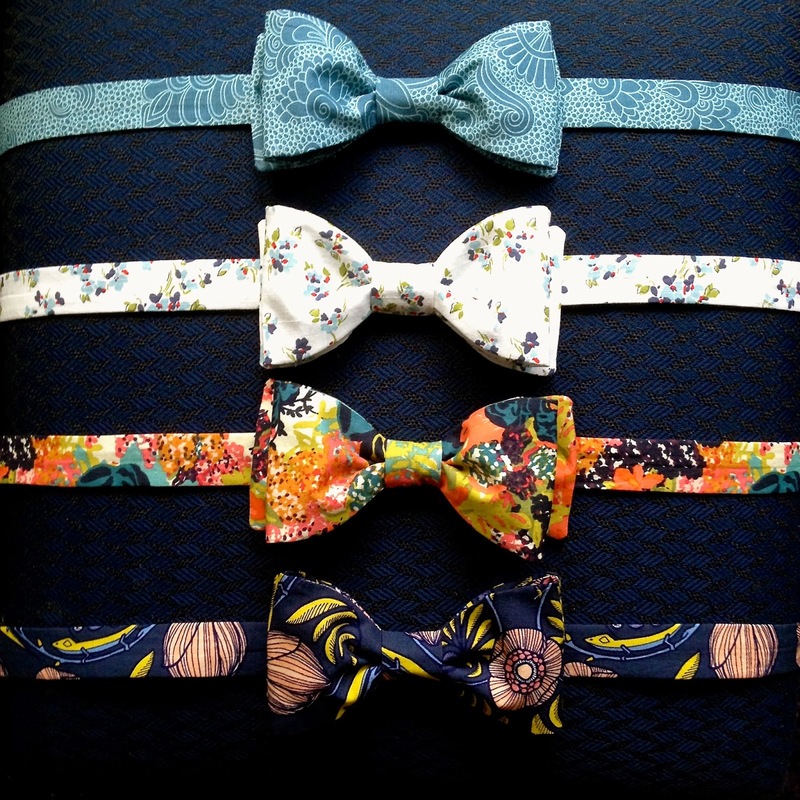 This week, I have also been working on a collection of matching bow ties. The gentlemen up at Cava restaurant will don them as their new uniform. The ones featured below are pre-tied for easy application and removal. Essentially, for the gentleman who doesn't like to fuss trying to figure out a proper knot. However, for the more skilled, or patient, we are also offering the real deal. I've shifted my studio to the Annapolis Valley in NS for a few weeks. I'm hanging out with my folks again making some great dinners, watching their fancy cable and stoking the fire. This part of the world is a whole lot different during the winter months, but there is something cozy and wondrous about it at the same time. Businesses shut down after Christmas for a few months but at this time of year there are lots of festive parties and concerts - the community loves to come together. We've had a ton of snow already and are due for a mighty nor'easter on Sunday. I don't mind it. Winter is so much more palatable in the country. Things I'm missing about my kitchen studio at home: the light, the constant stream of CBC Radio1 and the gluten free baked goods from my Landlords. Things I like about this new makeshift studio in my parents dining room: way more space to lay out fabric and cut, a better heavier iron and most importantly the chatter of my mom and dad in the background. Things are ticking along with my handmade business. Although I have a few plans for a couple of different lines, I am moving full steam ahead building my pocket square inventory. Here is an example of the final product with the branding. I'm really pleased with the simplicity of the design. I have also been doing some custom orders for personalized ladies handkerchiefs. 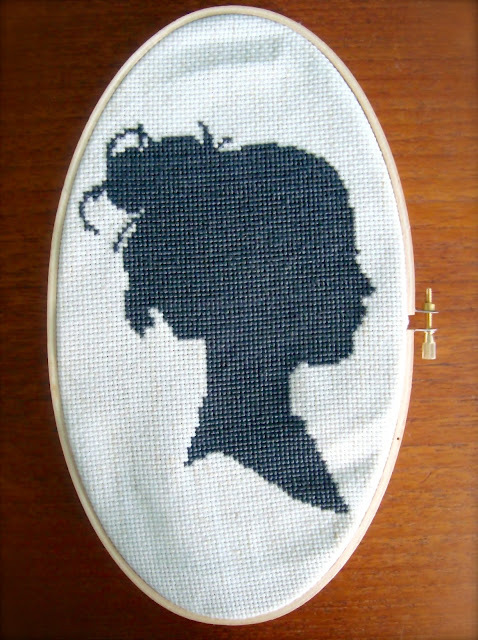 I'm pretty pleased with how the cross stitch monograming turned out. 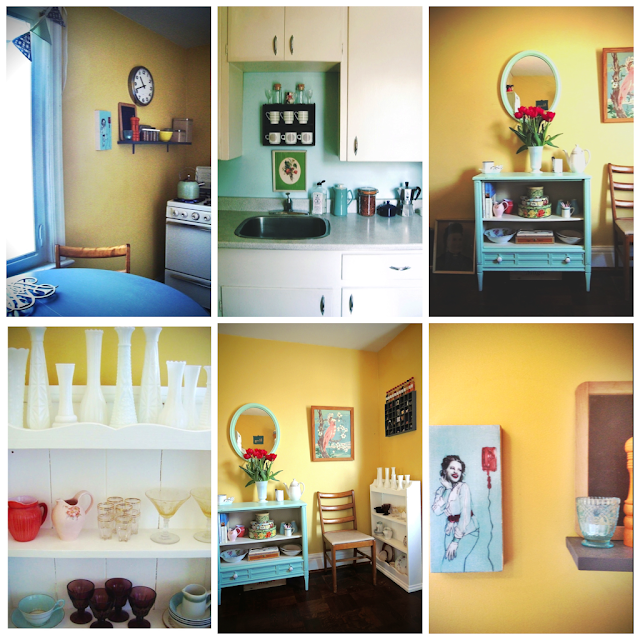 Many thanks to the Apartment Therapy folks for featuring my little space last week as a "House Call". It is fun to see it up there on the big internet screen. I have really enjoyed putting it all together over the years and am always pleased when other people appreciate my choices as well. One of the other things I do in my life other than decorating spaces, sewing pocket squares and refurbishing furniture is acting. For many years I've somewhat made a career of it, dabbling here and there on stage and screen. I realized that I rarely refer to my acting biz world on my blog as it is a place I've mostly dedicated to aesthetics and the things I enjoy making. I've been a longtime collector of vintage clothing as well as wares. I thought this would be a fun pic to share of a commercial I shot recently. I got to be an elite traveler parading through the airport in style with an entourage of 6 gorgeous model pilots. I love the vintage Catch Me If You Can vibe of this spot. And as for the company - I have to say my career was made all in one day. I can now retire happy. 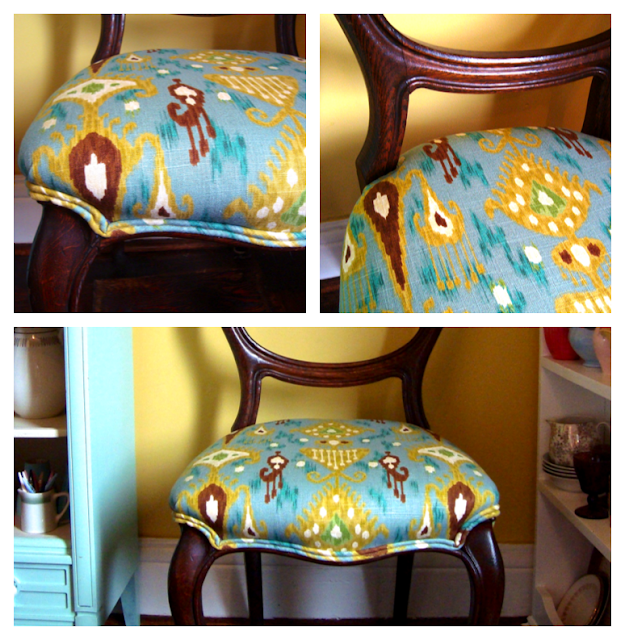 I've been working on this antique lady's parlour accent chair for the past few weeks and I am pretty happy with the result. I love this Robert Allen ikat giving this very traditional chair a modern spin. I finally mastered my own double welt chord for a polished professional upholstered look. This beauty is for sale if you know someone looking. It would also make a lovely christmas or housewarming surprise. Well...I'd like to take credit for the title but it comes from my mother who suggested I start a new business making pocket squares. I'm not sure I'm there yet, but I'm having a pretty good time putting these together. 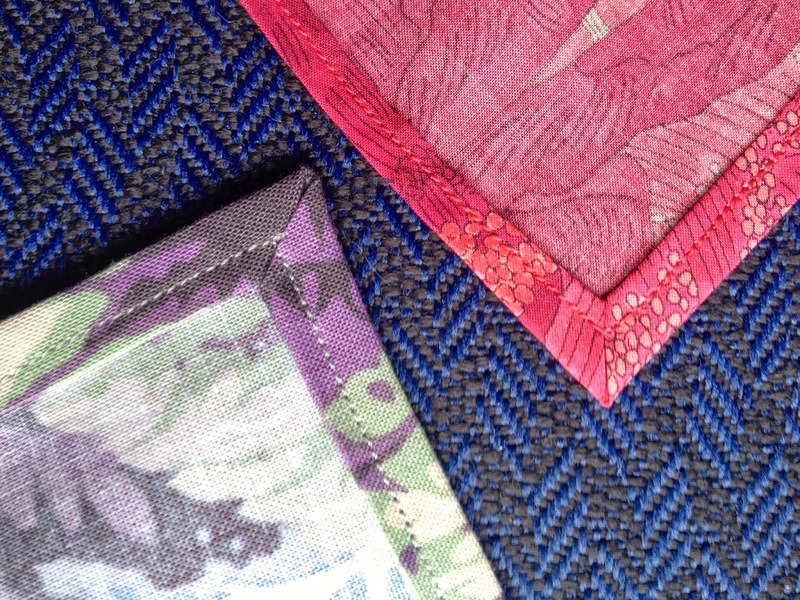 I had made a couple of pocket squares as a birthday gift a couple of months back and they have apparently gained some notoriety around the workplace so I have been making some more to distribute. 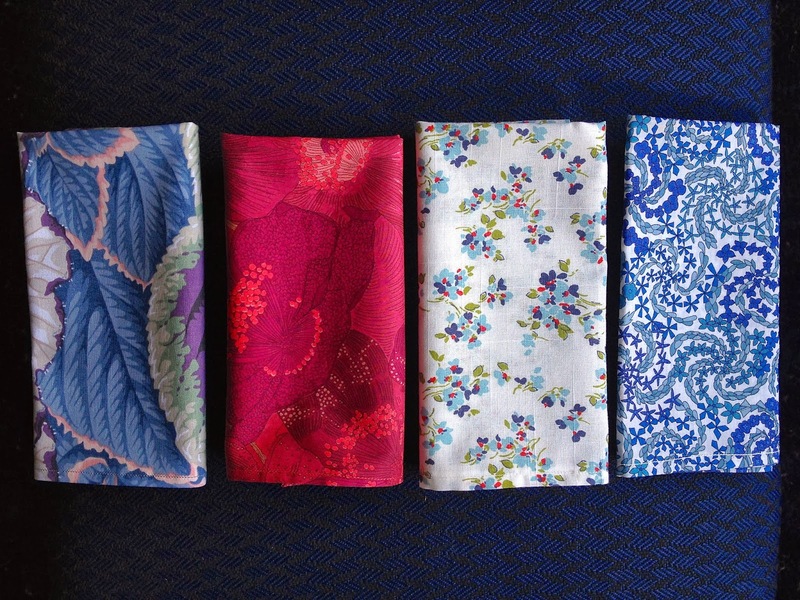 I happened upon some fat quarters of Liberty of London fabric at the Workroom and was able to get a couple out of each piece. The fabric is 100% cotton but is so finely woven it almost feels like silk. I've now learned how to miter corners, which is also a pretty great skill to have in your back pocket. 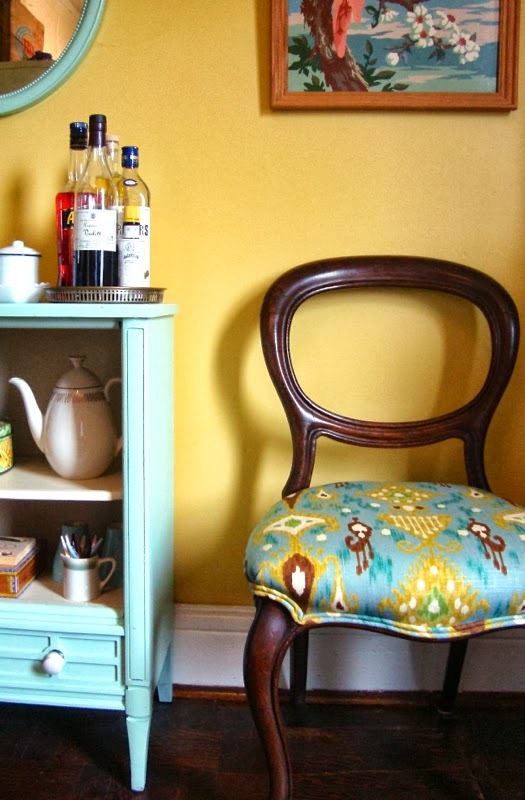 I was a little overwhelmed by all the colour in the corner of my living room, especially one said ikea cushion. I wanted something a little more put together and liked how all the blues worked to compliment each other. Since I have been working on a bunch of different cushion covers over the past couple of weeks, I whipped one out in this really great blue and white geometric. The pillow behind it is a navy blue velvet and the deer in front is the same as before. Kinda fun and a little more sophisticated. I've been a slave to the television commercial industry for the past couple of weeks hence my absence from here. I have, however, managed to do a bit of sewing during the off hours and finally finished a few throw pillows for my bed. The burgundy and white ikat geometric you see below comes from Designer Fabrics on Queen in Toronto and so does the pink striped crushed velvet, it has some great texture. I decided I wanted to go back to crisp white bedding but was drawn to these mustard and white striped sheets from West Elm. They were the perfect shade to match the yellow in the vintage "Pheasantry" Sanderson linen throw at the bottom of the bed. The antique framed prints above the bed keep with the bird theme. They come from a stall at Southworks Antiques in Cambridge ON. I stumbled upon them on a trip with my aunt a few months back and knew they would be absolutely perfect somewhere. I'm realising how difficult getting a good picture of this room is as it is quite small, painted deep burgundy and only has one window. This gives you a little glimpse anyway. 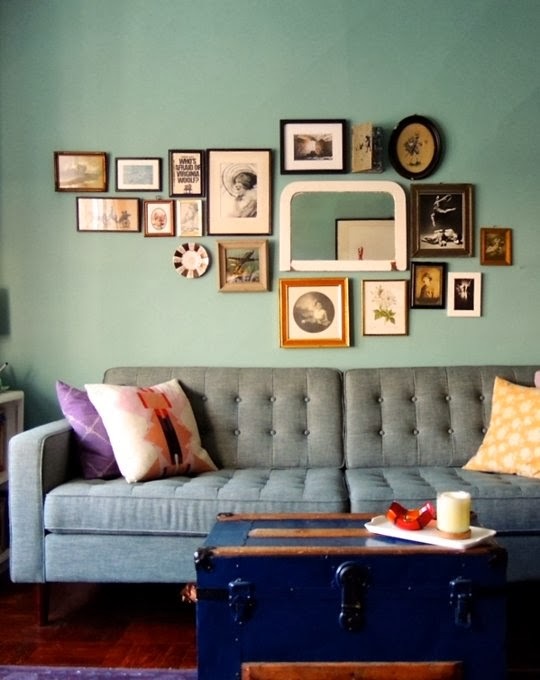 There were many pics of this gallery wall collage in my living room on the 'ol world wide web this past week. 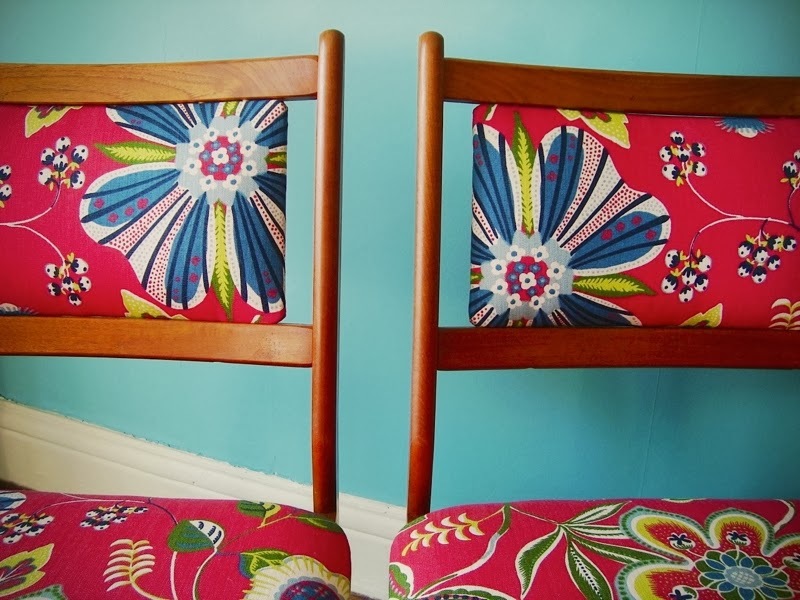 Many thanks to Design*Sponge and EQ3's blog Inhabit for doing some features on my designs. 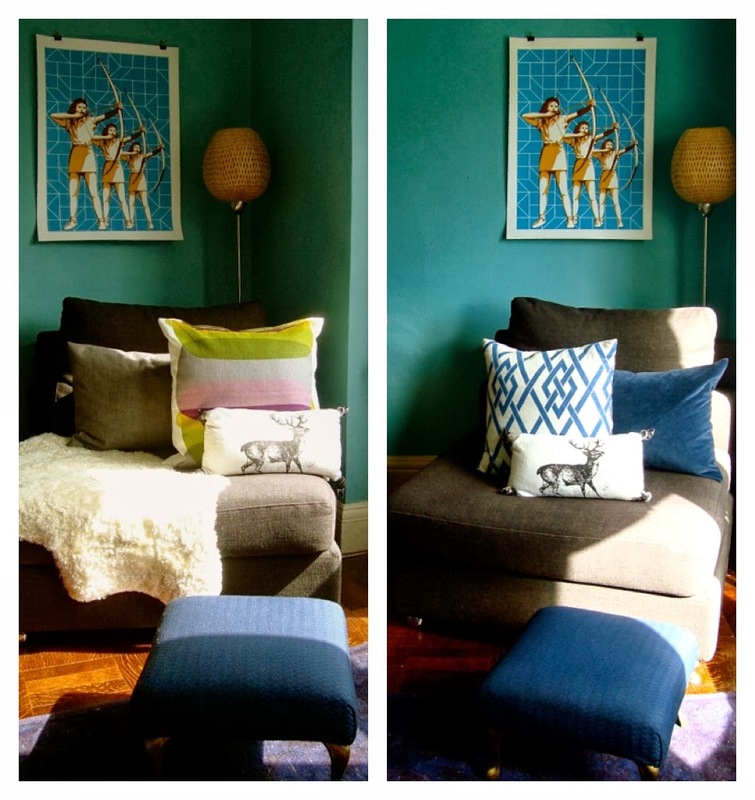 Max at Design*Sponge did a great piece on the two Mid-Century Modern chairs that I redid and Inhabit was kind enough to feature some of my living room details along with the Reverie sofa I purchased as a gift to myself for Christmas last year. Thank you so much to both sites for your kind words. I am grateful to have been given the opportunity to share my ideas with the world, outside of this blog. This kitchen is quirky. When I moved in my landlords assumed that they would have to buy a new stove for the tenant. I imagine they were somewhat overjoyed to find out that I was really excited by the old Findlay model - four years later and it's still cooking with gas. The layout of the kitchen isn't the most convenient space to work in, but what it lacks in function it makes up for in cheerful charm. 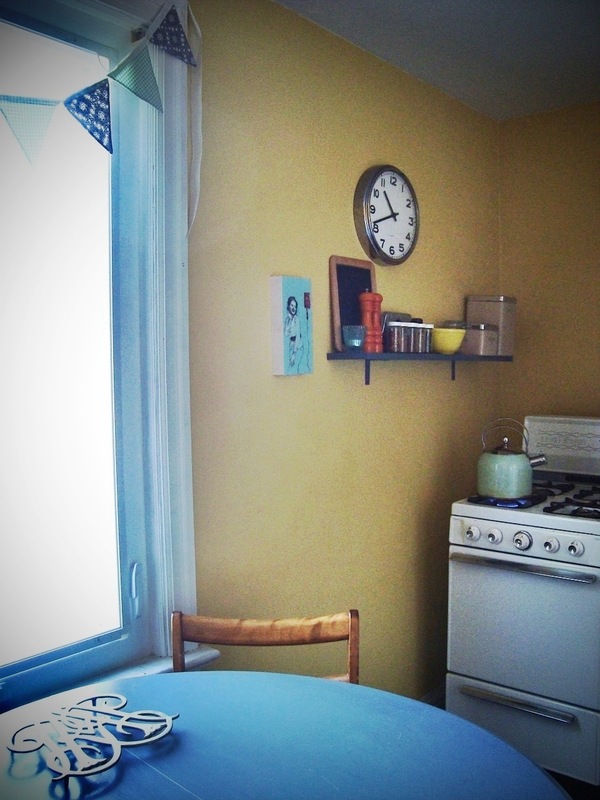 I love the character of the old 50's cupboards and wouldn't trade them for the sleekness of any new model. They just wouldn't work in here. Hello . My name is Kate Lavender. 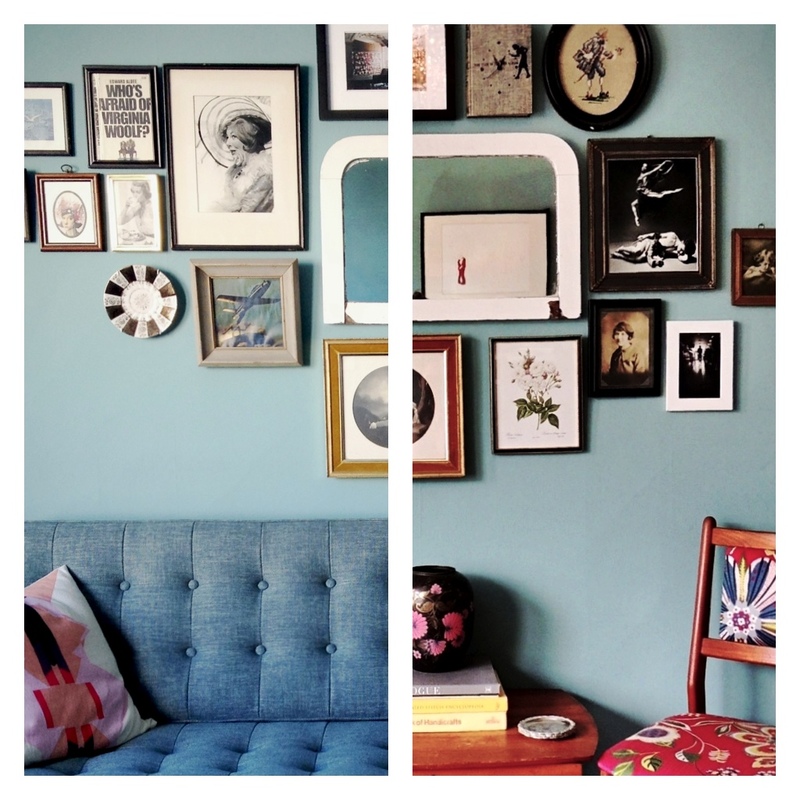 I am a decorator, stylist, collector and purveyor of fine vintage trinkets and wares. I endeavour to incorporate my one of a kind "curated" collections into contemporary living. I've spent many a day wandering the aisles of thrift shops, seeking out auctions and garage sales, looking for little lost treasures. I am interested in the combination of romantic and industrial and mid-century modern style. I love lace, needlework, teak furniture and antique glassware. I fill my world with collections of things from another time and aspire to share this passion with others. May I help you with something?